Global warming is no longer just a possibility: it is here staring us in the face, a stark reality. This warming is at least partly due to us (2). The increase in CO2 is mainly due to excessive fossil fuel use - oil, coal, gas. Atmospheric carbon dioxide (CO2) and methane (CH4) concentrations now far exceed the natural range seen over the last 65,000 years. The global increase in CO2 is primarily due to the use of fossil fuels. The increase in methane is very likely due to agriculture (2). Don't you think that the weather's a bit odd? Over the last 50 years it is more than 90% certain that, on land, there have generally been been less cold days, cold nights and frosts, while there have been more hot days and more hot nights. It is likely that there have been more heat waves, more heavy rainfall events, whilst the areas affect by drought have increased (1)(2). In the UK the autumn of 2000 was declared the wettest since records began in 1766 (3). If we carry on as we are (with the current CO2 emission reduction policies and initiatives in place) then global emissions will continue to rise which will very likely mean we will see larger climate changes to come (5). Which people make the most greenhouse gases? The USA - you will see from the graph below that in terms of emissions per capita that the USA leads the way, with other developed groups of countries following behind. No wonder they keep edging out of any binding agreements. So what can the world do about it? Appropriately charging for greenhouse gases is a very simple answer - everything else will be driven by this. The creation of an international carbon market (which would probably mean an international carbon tax and carbon trading scheme) could drive significant CO2 reduction across the board (6)(7). There are a lot of easy things you can do to reduce your greenhouse gas emissions. Please see our greenhouse gas reduction tips page. 1.The IPCC AR4 synthesis report: summary for policy makers. Page 1 (1.1, 1.2). 4.The IPCC AR4 synthesis report: summary for policy makers. Page 6 (3.1). 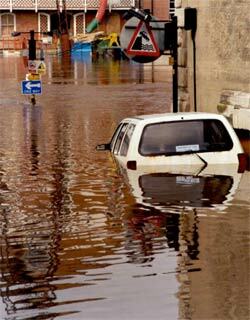 1.Flooding in the UK picture courtesy of the Environment Agency. 2.The IPCC Mitigation of climate change report: summary for policy makers. Page 9, figure SPM 6. 2.The IPCC Mitigation of climate change report: summary for policy makers. Page 5, figure SPM 3a.